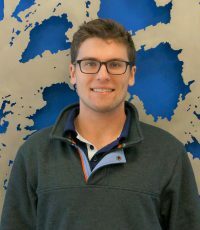 Sean McKinney serves as the Jesuit Volunteer Program Coordinator for Youth Challenge. He is responsible for facilitating adapted recreational activities, collaborating with program staff in the planning and initiating of programs, as well as enhancing and implementing the use of therapeutic recreation techniques. The Jesuit Volunteer Corps is a service organization that engages young volunteers to provide service in marginalized communities while focusing on four Catholic, Ignatian values: simple living, spiritual growth, community, and the pursuit of social justice. With these values in mind, Sean and several other volunteers who he lives with have dedicated a year of their lives to serve the Cleveland community through their positions at non-profit organizations.